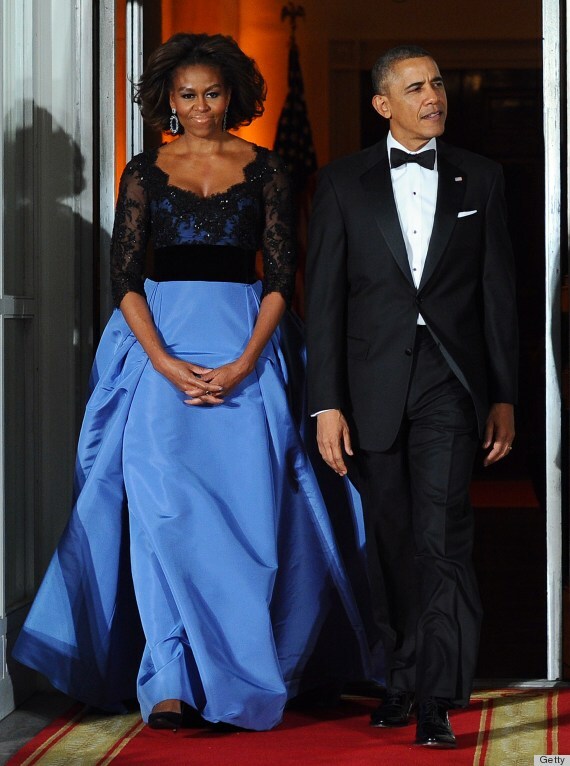 Michelle Obama wore an extraordinary designer dress to the State Dinner on 2/11/14; a dinner which cost between $200.K and 600.K in taxpayer dollars. That’s about average for a dinner of this type which honors French President Francois Hollande. Entertainment was provided by singer Mary J. Blige. The guest list included Julia Louis-Dreyfus, Rev. Al Sharpton, Bradley Cooper with Suki Waterhouse, basketball player Jason Collins, Stephen Colbert, and an assortment of state officials. 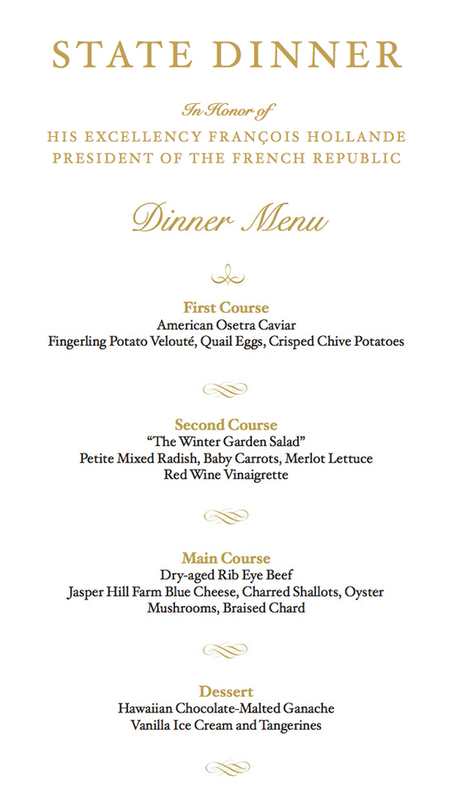 The menu celebrated the history between the US and France; much of the produce homegrown in the White House Garden and on farms across the states. That’s not to say the meal wasn’t costly. Caviar and rib-eye is not exactly an economically conservative choice. But back to the First Lady’s gown, designed by Carolina Herrera it was a stunning black lace bodice and liberty blue confection. One estimate of the cost of this dress is in the neighborhood of $12,000; twelve thousand dollars for a gown that may not be worn more than one time. This was after all a state dinner for the President of France where food and fashion are paramount. The poverty rate in the US is 15%, over forty-six million people. According to the US Census Bureau the poverty line for households of single people is $11,646. a year; that’s not a family, just one individual. So it isn’t as though the FLOTUS gown could support a family. So what is all the fuss about? As I said, this was a state dinner for the President of France. Granted the entire dinner could have supported a few families for a year. But who’s counting? I imagine those living at or below the poverty line might be a little put off. But I doubt the White House truly appreciates what poverty in the US looks like today. After all, the last time President Obama sat down to dinner with a family in the projects in Chicago, or on a farm in Iowa, or under a bridge in Detroit with the homeless was … never. Perhaps I am being too critical. Then again I doubt the President of France was given a tour of the poor neighborhoods in Washington. After all, we want to make a good impression on our friends abroad because appearances are so important.